The ICE XML SAX/DOM Parser is a native VCL Component for Borlands C++ Builder and Delphi. The parser supports 'event parsing' accordance with SAX and also the W3C DOM (Document Object Model) standard, which enabled the direct access to elements of the document structure. ICE XML is easy to use. Drag the component on a form, call the 'ParseDocument' function to start parsing, catch the events or use specific elements to read the values from the document. ICE XML based on a multi-threaded software architecture, so the parent-program will never freeze on parsing. XML Transmitter lets you test and use any Web Service. Upload any WSDL and automatically create an XML instance (request XML) for testing - works also for SAP Web Services! Request and response XML are displayed instantly. Save your configurations and reuse them anytime. Helps you build your SOA architecture. My CSV to XML Converter program is unlike other common conversion programs. It allows all fields of data in your CSV file to be designated as either elements or attributes and permits multiple levels of parent-child relationships. This provides maximum flexibility in the conversion into XML format. Simple, but thorough tutorials are provided to allow you to be productive quickly. Tool tips and a an intuitive user interface make working with the converter program easy! 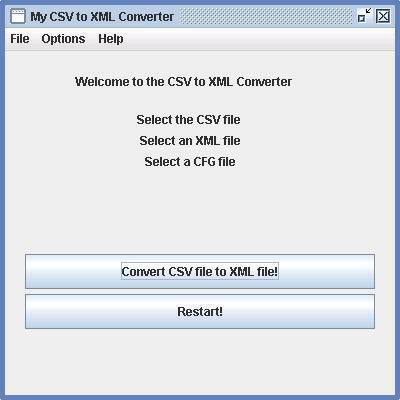 The My CSV to XML Converter program will also work with tab, space, and pipe separated data files, providing a full range of conversion possibilities. 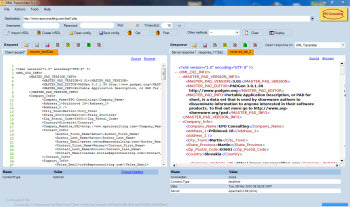 My CSV to XML Converter comes with an SQL Query Tool to access database information. This allows you to save the results in CSV format for conversion to XML format later. Once your data is converted to an XML file, My CSV to XML Converter allows you to perform an XSL transform and even provides an XSL Stylesheet wizard to help you create your own stylesheets. An XML Schema wizard is also provided to round out the suite of options. My CSV to XML Converter displays the result of your conversions in a simple text editor or your favorite XML compatible browser (Internet Explorer, Netscape, etc.). My CSV to XML Converter requires the installation of the Java Runtime Environment. The default setup instructions are extremely simple allowing you to be performing conversions in less than a minute after unzipping the program files. Testing has been performed in the Windows XP environment, but My CSV to XML Converter should run on Windows with Java version 1.4 or higher installed. SoftXMLCMS is a unique content management system for managing data in XML format . Easy graphical interface enables you to control the profiling data for the creation of hierarchical structures. Compatible with the most important browsers available in the market: IE 5.5+, Firefox 1.0+, Mozilla 1.3+, Netscape 7+, Chrome . SoftXMLCMS includes builtin powerful text editor for editing rich HTML documents, RSS feeds , Images and more. The Word-like interface of editor makes content creation easy for business users who know nothing about HTML and want to keep it that way. For additional convenience RSS validator and RSS previewer were added to syntax-check and preview RSS feed before using it in the article. Convenient and simple interface allows to upload images in following formats: gif, jpg, png,bmp. Once image is uploaded, you can use crop tool for nibbling to adjust image according to your needs. All images are uploaded to photo album for further using. While browsing the album you can insert the images in your article. If you want to integrate our editor with your unique website/design, please contact us here .